Does your baby or toddler freak out at the sight or sound of hair clippers? That’s understandable considering how intimidating the buzzing noise and aggressive vibration of some clippers can be. Finding the best quiet hair clippers for toddlers or babies can be difficult. Since you need to give your kid haircut, and a hair clipper is how to do it, what are your options? Easy! Get a cute clipper that generates the least amount of noise and vibrations when in use. Trust me, they exist, and you are in luck because I’m about to show you some of the top quietest clippers for toddlers money can buy. Some of them hardly vibrate and are so quiet you won’t even know they are on until they make hair disappear. 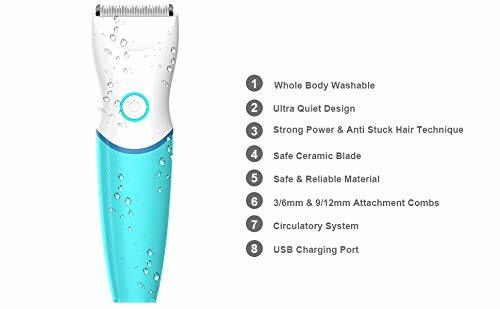 Elebebe Baby Hair Clipper – Quiet and Waterproof! What To Consider When Buying Hair Clippers for Toddlers? Philips has been making great appliances for over a century and their years of expertise have been used to create one of the best quiet hair clippers yet, the Philips Kids’ Hair Clipper Series 1000 HC1091. It is definitely one of the quietest hair clippers you can get. With this clipper, you can say goodbye to those tiring visits to the barber and become your kid’s own personal barber within the comfort of your home. Unlike regular adult hair clippers that can be quite heavy and sharp, not to mention frighteningly loud, the Philips Kids’ Hair Clipper silent operation and gentle blades make for a peaceful job. This means you no longer have to dread wailing and tears from your kid whenever it’s time to get a haircut. The clipper is easy to use and maintain, and it’s also designed with the safety of your kids in mind. It’s easily adjustable blades also mean you are not limited to a single hairstyle and can be creative with your kid’s hair. In the pack, you get more than just a clipper. The complete package includes three trimming combs of various lengths, a cute case for the clipper, and the clipper’s battery. That’s right! This soundless hair clipper is cordless. Which means you can take it anywhere and give your kid a haircut at a moment’s notice. You also never have to bother about you and your kid getting tangled up in electrical cords. The use of an AA battery means the clipper is safe for wet use, so don’t be shy about giving your kid a haircut in the shower. You can also conveniently clean the clippers under running water without worrying about damaging it thanks to its waterproof design. For a clipper that delivers a peaceful, quiet and enjoyable haircut for your kids, this Philips Clipper is definitely a great option. Even you can enjoy it for a shave since the clipper can cut as low as 1mm. Get your own Philips Kids’ Hair Clipper Series 1000 HC1091 here! Here’s another cordless kid’s clipper with an impressive performance. It is also definitely among the most soundless hair clippers you can buy. This Gland is designed for both professional and home use. It’s tested and proven to be safe for kids of all ages, including toddlers. Unlike adult clippers that can hurt the tender scalp of toddlers, this clipper’s ceramic round-shaped blades ensure your baby enjoys a peaceful and pain-free haircut. And when it comes to noise, the Gland Kids Professional Cordless Hair Clipper stays quiet at below 50 decibels when turned on. Vibration is also kept at a minimum and can even be soothing for some kids. The “professional” in the Gland Kids Professional Cordless Hair Clipper’s name becomes apparent in the level of precision the clipper offers. You can go for simple haircuts or get really fancy with your kid’s hair with impressive accuracy. But unlike the Philips HC1091 which can cut as low as 1mm, this Gland can only cut as low as 3mm. It’s doubtable you’d ever want to cut your kid’s hair lower than 3mm anyway. The clipper is waterproof so cleaning it with water is not a problem, and you can use it to give your kid a haircut while he/she showers. Charge this cordless clipper for an hour, and you can use for 100 minutes, which mean you get a fast charge and longer cutting than most other clippers. If you want a safe and effective clipper with minimum vibration, the Gland Kids Professional Cordless Hair Clipper is definitely among the best quiet hair clippers around. 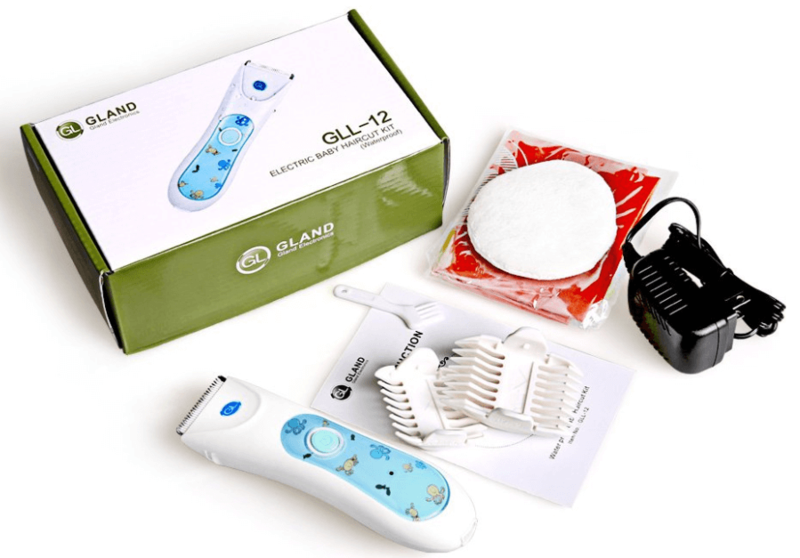 Get your own Gland Kids Professional Cordless Hair Clipper here! Philips Norelco Quiet Hair Clipper for Toddlers and Kids. Don’t be surprised another Phillips clipper made the list of quietest hair clippers for toddlers. The brand definitely has the resources and expertise to pull off such a feat more than once. The Philips Norelco CC5059/60 Kids Hair Clipper is cordless, powerful, and ideal for parents who’d rather give their kids a haircut at home. You can also take it on trips and even cut your kid’s hair while on the move. 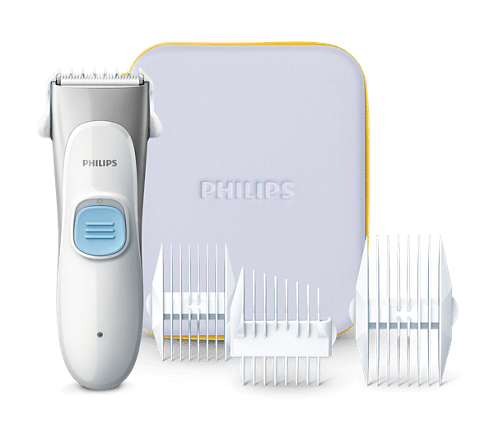 This Philips baby shaver requires hardly any maintenance, which means you can keep using it with hardly any hassle. It’s also surprisingly lightweight so you can cut and style the hair of a legion of kids before your hands get tired. There’s also its balance and precision to look forward to for styling your kid’s hair any way you like with impressive accuracy. Its rounded blades take the tender scalp of your toddler into consideration, so no scratches or discomfort for your wee babe. It’s also quiet enough with minimum vibration to make sure your kid doesn’t get spooked during a haircut. 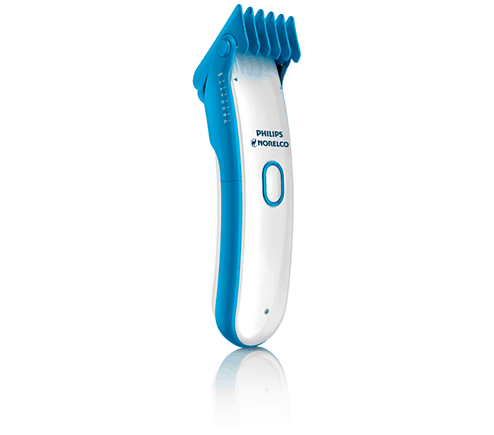 Get your own Philips Norelco CC5059/60 Kids Hair Clipper here! Here’s one noiseless hair clipper package that tries to give you more for less. Asides from being among the top quiet clippers for toddlers, it also offers three clipper heads for different types of cuts. There’s a clipper head for regular haircuts, another for a close shave that adults can also enjoy, and a third for the nose and ear hairs. I don’t know about you, but offering so much seems a little unfair to the competition. The Kids 3 in 1 Hair Clipper is also considered to be among the safest around thanks to its waterproof design that’s suitable for wet or dry use. Their ceramic blades can’t hurt a baby’s scalp even if they tried, unlike most adult clippers and sharp pointy scissors. But don’t let the safeness of these clipper’s blades fool you. They are still sharp and will mow through hair with ease. They are also surprisingly durable for a baby product which means you’ll probably still be using them long after you kid stops being a toddler. Maintenance is easy thanks to the easily detachable blades. And you have the option of using the clipper either as a corded or cordless device. Get your own Elebebe Baby Quiet Hair Clipper here! Here’s another lightweight clipper with an effective design and quiet performance. It’s also a low vibration hair clipper that’s waterproof and suitable for toddlers, kids, and even adults. Charge up its battery, and you can use it for 50 minutes without rest. Its safe blades also make sure you don’t hurt your kid during haircuts; Especially if cutting or styling the tender areas around the ears. The downside of this Yijan is its long charging time – almost 6 hours for just 50 minutes of use. That’s not very impressive. Fortunately, you can also use it as a corded clipper. The Yijan HK668S makes up for its shortcomings by being available at a super attractive price and being easy to maintain. Just pop out its ceramic blade, clean it, and pop it back in. Its noise-blocking technology is also impressive, generating only 50 decibels of sound. 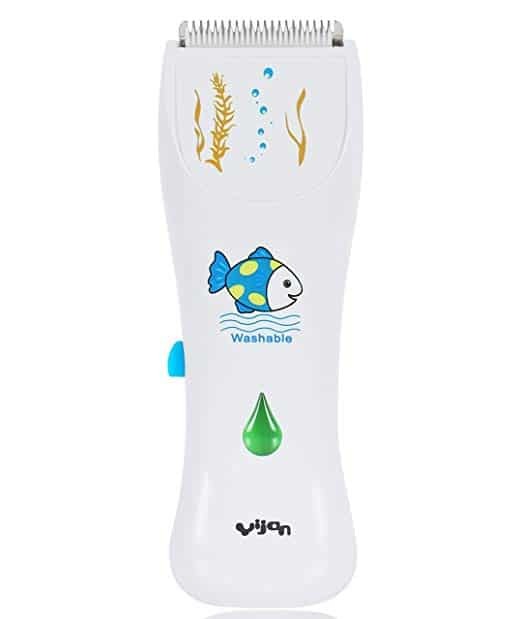 If you are more focused on a soundless hair clipper for your kids and low cost, the Yijan HK668S will suffice. Get your own Yijan HK668S Quiet Professional Hair Clipper here! The company Gland couldn’t stand the thought of Philips being the only brand with two top quiet clippers for toddlers. So they gave us the Gland L-15. This smart waterproof clipper will safely cut the hair of any child between the ages of 0 and 12. It is IPX-7 level waterproof, which makes it safe for use even in bathtubs. You can also wash its ceramic, smooth, treated blade under a running tap with no problems. When it comes to noise, Gland makes sure to keep this clipper as quiet as possible with minimal vibration. And even though it’s practically soundless, this clipper delivers an amazingly accurate and clean cut. In the box, you’ll find not just the clipper, but also blade oil, a charger, a user manual, a cleaning brush, a sponge powder puff, two fixed combs, and a cloth. It’s a pretty great deal especially in light of the Gland L-15’s friendly price. Get your own Gland Smart Waterproof Ultra Quiet Chargeable Professional Hair Clipper here! Messing up your kid’s hair cut can be a pain, especially if it’s accompanied by crying and screaming due to the loud noise hair clippers can put out! Using a low-quality hair clipper can alter your child’s appearance and mood in a heartbeat. For these reasons alone it is highly important that you buy a good quality hair clipper from a reputable brand. I would guess the main reason for reading this article is because you’re trying to find a set of quiet hair clippers for your toddler or baby. Certainly nothing wrong with that! There are other factors you should consider before making your final decision when buying good quality hair clippers. Most parents place the safety of their child above all else so when it comes to giving your child a hair cut, you certainly want to make sure you’re buying a safe product. This is especially important if you are a beginner at operating clippers or trimmers on your child’s head. Make sure to buy clippers with properly designed guards with a good protective mechanism to prevent accidental injury to your child or yourself when operating the product. Any hair cutting device that comes equipped with a steel blade has the potential to break or fail to function properly if it is not kept cleaned or correctly maintained. Because if this, it is essential that the hair clipper you’re thinking of buying is easy to keep clean and maintain without too much effort. 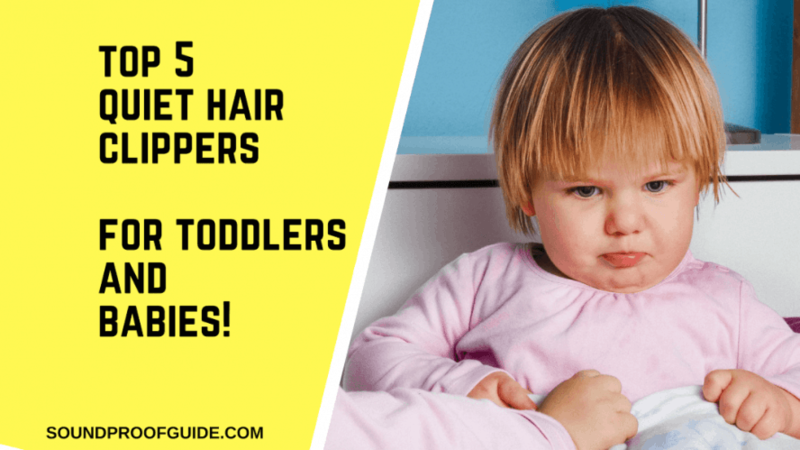 If you are looking for the best quiet hair clippers for toddlers, these are your best options. Just remember not to focus solely on price or noise levels when making your selection. Asides from quiet and affordable, you’ll also want a clipper that can deliver the best cut and will last the longest. Fortunately for you, all the above options fit this profile.